The touched president of the Philippines released the list of names of those politicians, cops, and judges allegedly involved in illegal drug trade on Sunday, August 7, 2016. Duterte’s list shocked the whole country. The president read the names one by one in a nationally-televised speech after midnight. He said the names were validated by the police and the military. Duterte said, "I ordered the validation. I am the one reading it and I am the sole person responsible for this one." "They will also be investigated for criminal and administrative charges," he said. Since assuming power on June 30, The president has rallied security forces in an unprecedented crackdown on drug suspects. Duterte also earlier named five police generals and several other local executives as alleged protectors of drug rings. According to ABS-CBN News, they counted 852 drug-related deaths from May 10, when Duterte's election win became clear, to 3 p.m. of August 5. 62% (percent) were killed in police operations, twenty-nine percent were killed by unidentified assailants while nine percent were dead bodies found away from the crime scene. Listed below are all the officials as read by Duterte. 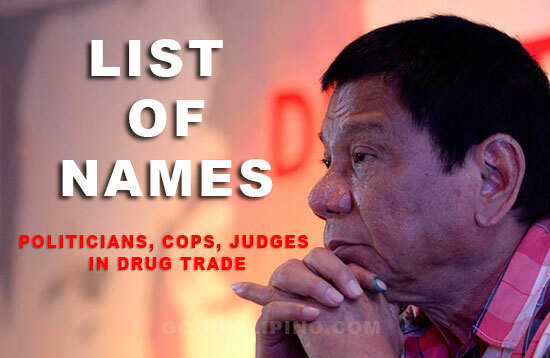 What do you think of Duterte's list of names involved in illegal drug trade? Please comment your thoughts below. Comments or suggestions about "President Duterte releases names of politicians, cops, judges in drug trade" is important to us, you may share it by using the comment box below.